As mentioned on meta.stackexchange.com several months ago, all network sites will be getting updated themes. 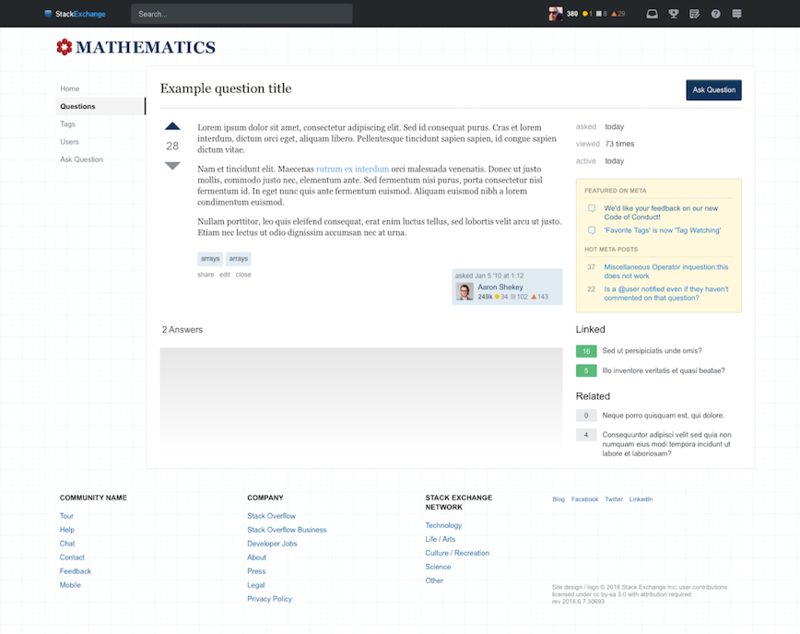 Mathematics is one of the first sites that will be updated. As such, I'm posting the design here so you can see how the new theming will be applied to your site. 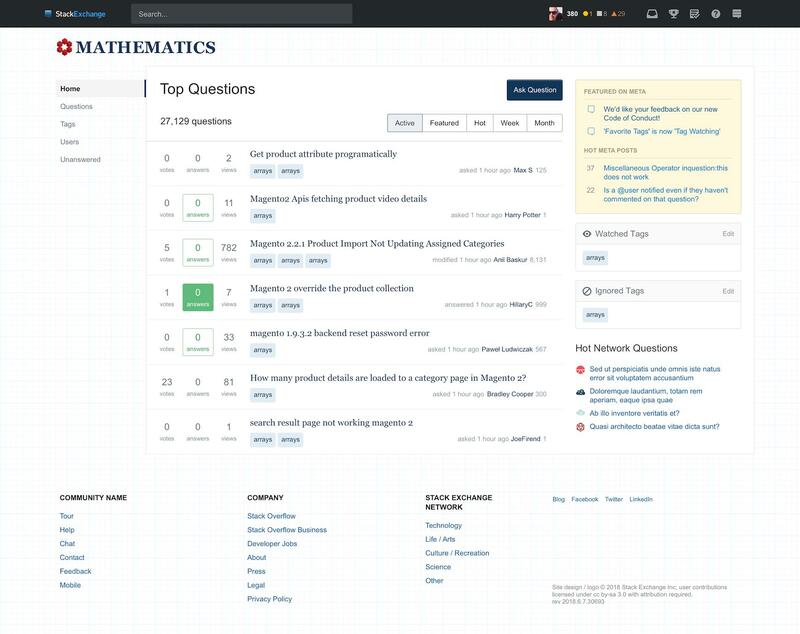 I like the simplicity of the current math design, and I like the simplicity of the redesign. The graphpaper background is maintained and appears to remain pretty subtle. Cool. We aren't going to revisit the choices we've made around simplification, so it would be more productive to keep feedback focused on the application of the new theme scheme. I don't really understand what this means. I know when the redesign was first brought up, there were lots of questions concerning the left nav bar and whether it could be collapsed or not --- and whether resizing prioritizes the content bar or the nav bar (the old gif used to show that a surprising amount of weight was given to the nav bar). But I gather that these sorts of ideas are things that you might call "unproductive" right now? There is one major topic concerning the application of new theming to this site that isn't apparent from the mockups: how will the responsive design interact with MathJax? This is clearly a fundamental part of this site. 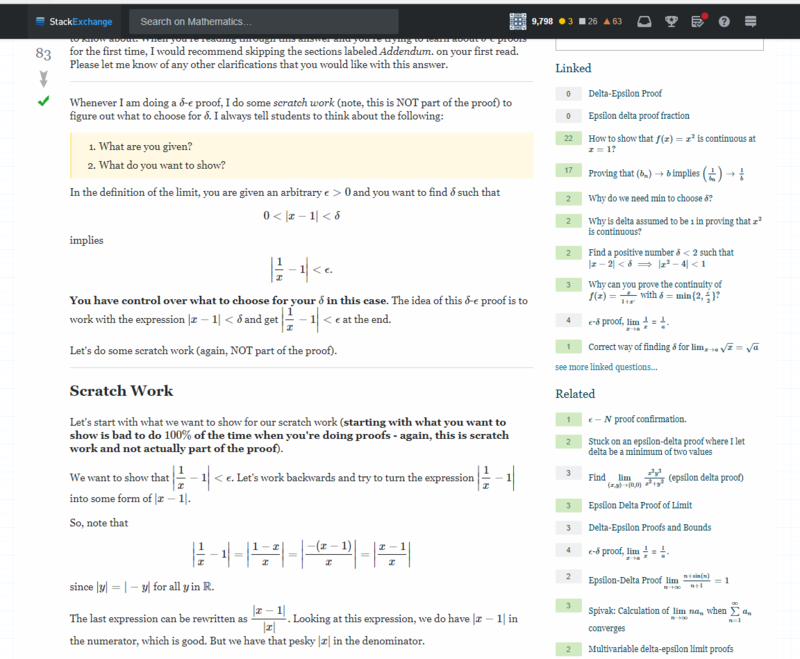 Further, there are lots of equations and lines written that conform to the current default width standard of the site. I know you've thought of very many things, but it's worth checking: are you preserving (or increasing in size) the minimum width of content divs? On small screens, this would mean that it's necessary to scroll sideways. If not, then I believe that many (maybe tens of thousands?) current MathJax posts would break in some way, such as overlapping with other elements. Not sure if this is the most appropriate spot to report this, but here it is anyway. Something similar also happens when answers are submitted. Browser is Chrome 67.0.3396.99 on a Windows desktop. It appears that this happens with all answer links. Can users vote to change the main site's user interface?